The Parent’s Guide to Homeopathy: Safe, Natural Remedies For Children, From Newborns Through Teens is a user friendly book spanning from newborns through the teen years. Parents will be able to use this book for just about any acute ailment that arises. This book addresses over 150 acute conditions. The section on winter ailments, first-aid, and travel can be used for the whole family. If a child wakes up in the middle of the night with an earache or develops an upset stomach while traveling, parents will have a storehouse of knowledge at their fingertips in this book. Now translated into two languages. 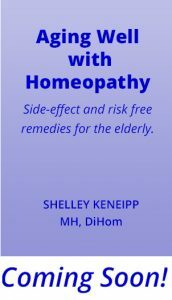 Aging Well with Homeopathy, Side-effect and risk free remedies for the elderly. This book addresses acute conditions that may be experienced by an aging body. Shelley addresses such things as: aches and pains, acute back pain, bone breaks, remedies to help recover after a stroke, acute digestive upsets, remedies to aid before and after surgeries to different parts of the body, occasional insomnia, muscle cramping, acute nerve pain, and vertigo. These are just a few of the conditions this book addresses, which can be treated with homeopathy. In addition, this book gives supportive measures for maintaining good health in the bones, brain, digestive tract, eyes, heart, joints, lungs, and spirit. Coming soon; this book with be a welcomed aid in keeping the aging body in the best condition possible.